Companion Book to all the great books on conducting out there. I wrote this book as a companion to the many outstanding books used in conducting courses for future orchestra, band, and chorus teachers. Those books contain virtually all the basics about conducting. Igniting Response teaches teaches teachers how to get their students to respond; That's what's important - their response. Knowing what to do - how to make a proper left hand gesture for a crescendo, for example - is one thing. Getting students to make that crescendo is something totally different. I wrote this book as a companion to the many outstanding books used in conducting courses for future orchestra, band, and chorus teachers. Knowing what to do - how to make a proper left hand gesture for a crescendo, for example - is one thing. Getting students to make that crescendo is something totally different. Nathan and his bass drum illustrate this perfectly for us! ​When Nathan strikes his bass drum with good technique and strong intent, he'll get a ringing "boom." Every time. It's physics. 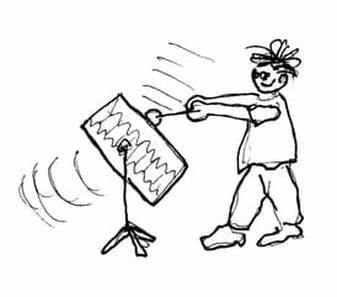 When we conduct, our downbeat can be as clear, well prepared and as strongly intended as Nathan's stroke. But unlike his bass drum, our students' response doesn't obey the laws of physics. Maybe they're not watching, they don't like the piece, or are looking at a friend. They might be tired, worried about an exam, or have a family problem. ​To get our students to respond to the gestures we learned in classes and textbooks, we need to engage their active involvement. When we do, their self-talk becomes, "This is important; I'm taking responsibility for getting it right, and I want to do my very best!" ​...and we ignite the response we want. That's what Igniting Response to Your Conducting is all about: how to ignite students' respose to what's been learned in textbooks and classes. After extensive research by myself and others, I'm not aware that a resource like Igniting currently exists.